Pen and ink drawing by Frederick Charles Maisey of architectural details from the Nilakanth Temple at Kalinjar, taken from an album of 60 drawings dated 1847-1854. 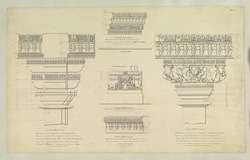 This drawings depicts the details of some of the columns of the temple. The shafts and bases are carved with floral and geometrical motifs and the capital has figures of dwarves, ganas, which support the entablature. Kalinjar is a very ancient site in Bundelkhand. Its fort, one of the oldest in India, was referred to by Ptolemy as Kanagora. It crowns a plateau of the Vindhya mountains 375 metres high. It was taken by Qutub-ud-Din Aybak in 1202 who also destroyed the temples. A few centuries later, with the rise of the Mughal Empire, a new series of attacks took place. In 1812 Colonel Martindell attacked the fort and the fortifications were dismantled in 1866. Within the fort there are numerous archaeological remains. The Nilakanth Temple is the holiest shrine of Kalinjar. In the Archaeological Survey of India Report of 1883-84 A. Cunningham wrote, "The great lingam of Nilakantha is situated in an outwork in the middle of the west face of the fort. The upper gate, leading in the outwork, is attributed to Raja Parmal, or Paramardi Deva, who reigned from A.D. 1167 to 1203. ...A second gate, which leads into the courtyard of the temple, has no inscription. But on the rock on the right hand of the descent there are numerous small caves and niches...The actual shrine of the Nilakantha lingam is a small cave with the remains of a fine mandapa, or hall in front. The facade of the cave has been very rich, but is now much broken...On the jambs of the door there are figures of Siva and Parvati with the Ganges and Yumna Rivers. These are of the Gupta period. The pillars of the hall are later, and belong to the time of the Chandels.The roof of the Mandpa is now gone, bust most of the pillars and pilasters still remain, forming a square with four on each side, and four in the middle."